Reena Virk was a fourteen year old teen from Saanich, British Columbia. She would have been turning fifteen on March 10, 1983 but sadly, she never made it. Reena was originally from India and transferred to Canada as a child. Her immediate family was described as “a minority within a minority,” as they were of the Jehovah’s Witness religion in the local South Asian community of 3,000 which was predominantly Sikh. 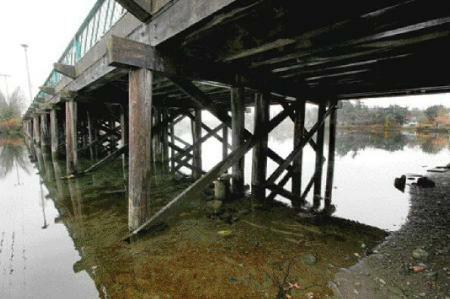 On the night of Friday November 14, 1997, Reena was invited to a “party” by her friend near the Craigflower Bridge, a popular hangout spot, west of the city of Victoria, British Columbia. She heard rumors that her bullies were going to go there and ‘beat her up’ but that didn’t stop her from continuing her life. At first everything was fine, Reena was enjoying herself and the group were said to be drinking and smoking. But then, the “Shoreline six” arrived, a group of girls known to bully Reena. They swarmed the teen. Witnesses who were at the Bridge that night would later say that one of the Shoreline bullies stubbed out cigarettes on Reena’s forehead, while the others stood by and watched, some even laughing. The ringleader was a teen named Kelly Ellard, a girl who had strongly disliked Reena for reasons unknown. Reena was then taunted, repeatedly hit, punched and kicked. 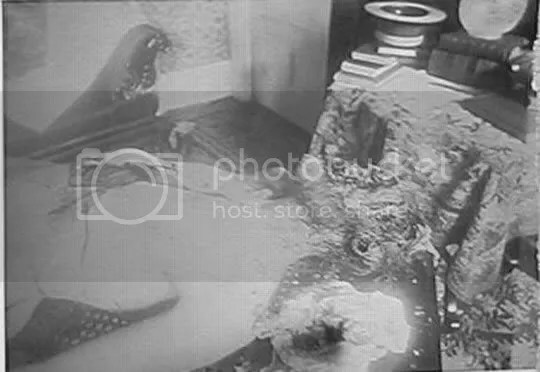 She was visibly upset and scared but got no sympathy from her attackers who put out several more cigarettes threw-out her body and then yanked her hair and attempted to light it on fire. This first beating ended when one of the girls stepped up and told the others to stop. This was the only attempt made by all that were there that night, to stop the attack. 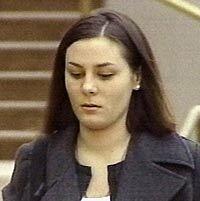 Reena attempted to walk away from the group, but was followed by two Kelly Ellard, William Glowatski and an accomplice. The pair dragged Reena to the other side of the bridge, no longer in view of the others. They forced her to remove her shoes and jacket. At this point Reena was sobbing, begging them to stop as she layed on the ground shivering. They ignored her pleas and started punching and kicking her as she tried to shield herself. Glowatski had no problems with Reena but he decided to join in, kicking Reena twice in the head. Sometime during the beating, Ellard smashed Reena’s face onto a tree, knocking her unconscious. With the help of Glowatski, Ellard dragged Reena’s body near the water. At this point she was not unconscious and was begging her attackers to stop. She was ignored. Ellard forced Reena’s head under water at the George Waterway. She was holding Reena’s head down by her foot. Glowatski stood by, watching. Reena struggled, desperately trying to save her own life. Reena’s struggle became weaker until finally she stopped moving. Despite an alleged pact amongst the people involved to not “rat each other out”, by the following Monday rumors of the alleged murder spread throughout Shoreline Secondary School, where Virk was a student. Several uninvolved students and teachers heard the rumors, but no one came forward to report it to the police. 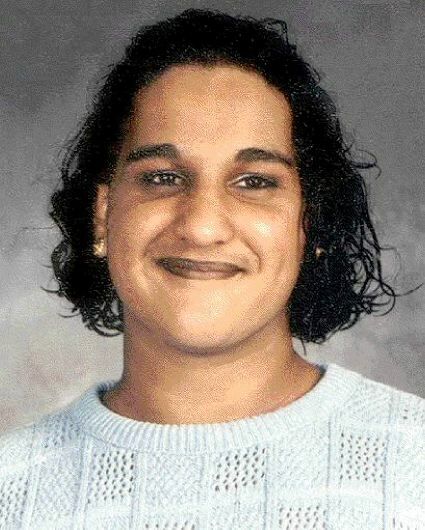 The rumors were confirmed eight days later, on November 22, 1997, when police using a helicopter found Reena’s partially clothed body washed ashore at the George Waterway. 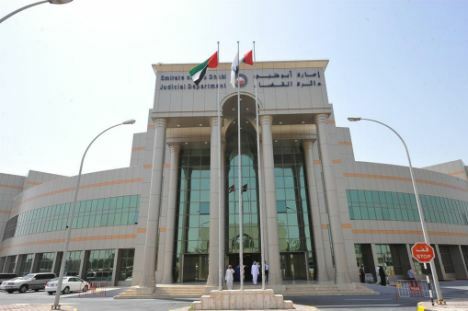 The coroner completed the autopsy and ruled her death was by drowning. However, it was later revealed that she had sustained significant injury, and that the head injuries were severe enough to have killed her if she had not been drowned. Ellard was sentenced to life in prison after three trails. She still maintains her innocence and shows no sympathy for the crime committed. 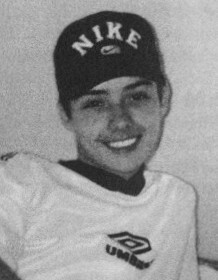 Glowatski was sentenced to life in prison but because he was a minor at the time, he had a chance of parole. Reena’s parents didn’t contest his 2004 court hearing, claiming they’ve forgiven him because he showed remorse and owned up to his actions. He was denied however. But in the fall of 2005, when the two came face to face in a semicircle of chairs in the basement of a church, something very different happened. “It was the most unusual experience I had encountered in my life,” the Victoria father later recounted in his book, Reena: A Father’s Story. This remarkable act of reconciliation is often cited as an example of the potential of restorative justice – the concept that true healing after a crime doesn’t necessarily come from harsher punishments but rather from the coming together of criminal and victim, giving them a chance to understand one another and work to repair the harm done. Both of the Virks also spoke at the hearing, telling the panel that healing cannot begin until an offender owns up to their actions. Suman Virk said that Glowatski’s statement on Wednesday is “huge,” and was tremendously helpful to the couple. 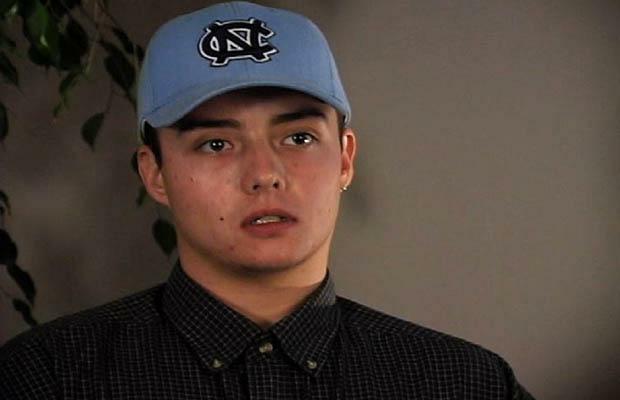 The Virks also said they think the young man is on the right path, and that they supported him getting unescorted absences as he continues to serve his life sentence. The panel members agreed, noting Glowatski’s positive record while in prison. His next step will be to apply for full day parole. At the end of the hearing, Glowatski thanked the Virks, giving each of them a hug. 2 years ago, the drama program at my school wrote and performed a play called The Holding Room based on the murder of Reena Virk. It was originally intended as a competition piece for a school theatre competition but it ended up attracting a lot of attention and resulted in Reena’s parents coming from the other side of the country to see it. 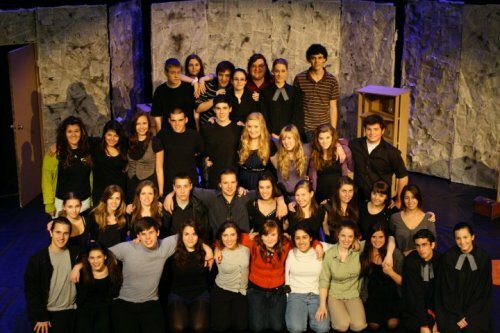 Even though I don’t really act anymore, this entire show experience was one of the best of my life. Despite a law in place, poor women from marginalized communities in Jharkhand continue to be branded as ‘witches’ and tortured, murdered, evening burning at the stake. Mukesh Rajak describes the plight of Rubiya Bibi – a poor Muslim woman and a mother of 4 children from his own district who has been declared as a witch by her rich and influential villagers and brutally tortured. All the torturers were men. The video shows how, along with the women accused of witchcraft, her children and family also are victimised and isolated from the society. The woman is also not allowed to work. Jharkhand was one of the first Indian states, to adopt a law against witchcraft-related cruelties and crimes against women. The law – Witchcraft Prevention Act, 2001 provides for severe punishment for those who brand/torture/kill women as ‘witches’. Ironically, the state still continues to top the list of women branded as witches. 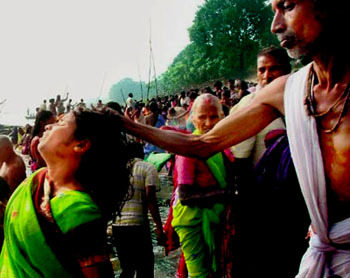 The National Crime Records Bureau (NCRB) records state that Jharkhand has witnessed deaths of 249 persons (mostly women) between 2001 and 2008 for “practising witchcraft”. The Jharkhand Criminal Investigation Department figures maintain that as many as 1,200 witches managed to survive torture and attacks between 2001 and 2009. The figures suggest that there has been a rise in the number of attacks on women accused of being a ‘witch’. While the attackers aim to kill the victim, some lucky ones manage to escape. Rubiya was also lucky to have survived. But her in-laws threw her out of their house. Rubiya’s husband who is mentally unstable, was unable to protect her. Uneducated and denied work, Rubiya has no means to support herself or her children. For her father, a daily wage labourer, its extremely difficult to feed so many mouths. It’s this unjustified sufferings of Rubiya and her family that made Mukesh take up her case to report. He is especially bitter about the way Rubia’s children are ostracized, beaten and taunted every day. During the shoot of this video Mukesh also spoke to several other victims of witchcraft like Rubia. These meetings made him realize that it is only the poor and defenceless women who are handpicked by their rich and powerful neighbours to be declared ‘witches’. Mukesh is keenly following the case filed by Ribiya Bibi. He wants people watching this video to create pressure on the police of Deogarh to act on the case, so that this woman can get justice under the existing anti-witchcraft law. 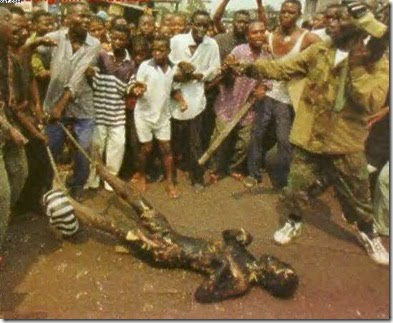 1998 Witch Murder – An African woman was labelled a witch, tortured and burned alive by her community. Photo shows how horrific these tragedies are. 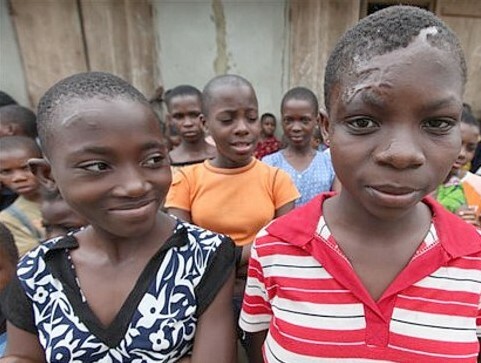 Nigeria news reported that many Nigerian child are homeless, forced to live on the streets after being driven out by families or communities because they were suspected of being ‘witches’ In alot of cases, these African children are tortured and even murdered after being branded witches. Dimbeswari Bhattarai (front), a witch doctor, or ojha, speaks during an interview with Reuters in Uttarkuchi village in India’s northeastern state of Assam September 7, 2006. Police say that around 300 people have been killed in the state in the five years from 2001 for allegedly practising witchcraft. → The Borden house that still stands on 92 Second Street may now be a bed and breakfast but on August 4, 1892 it was witness to one of the most brutal, unsolved murders in American history. We may never know what really happened that day. To start from the very beginning – Andrew Borden was one of the richest men in the city of Fall River, he was a self-made businessman with important titles such as President of Union Savings Bank, Durfee Safe Deposit and many others. He had two daughters with his first wife Sarah Morse. 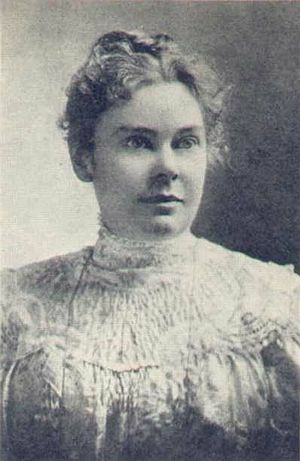 The eldest being Emma Borden who was born March 1st of 1851 and the youngest, Lizzie Borden born July 19th 1860. Lizzie would not grow to know her biological mother because in March of 1863 Sarah died of a hemorrhage. On January 18th 1865 Andrew was remarried to Abby Gray, a women that will be remembered due to her graphic departure from life. It was close to 9am when Lizzie walked down the stairs of her home like many mornings since the family bought the home in 1872. She saw her Stepmother Abby dusting the dining room, Her father Andrew sitting in his large chair in the sitting room and Bridget – the maid who the Borden sister’s insisted on calling ‘Maggie’ which was the name of a pervious servant – was grabbing her pail of water and long pole with a brush to go wash the windows. Although Bridget had cooked breakfast earlier Lizzie had said she was not hungry and instead had a cup of coffee, Her father had mentioned he might not go to the post office and mail a letter to Emma his eldest daughter who was in Fair Haven for two weeks visiting friends. Earlier that morning about 7am Lizzie’s Uncle John Morse who was the brother of Andrew’s first wife Sarah had left to go visit his nice and nephew. He made several visit’s a year from his home in Dartmouth to visit family and conduct business in Fall River. Around 9:15 Andrew Borden left and went downtown while Abby went upstairs to make the bed that John was staying in. At 9:30 Abby come downstairs only for a moment till she decided she needed fresh pillowcases and went back up. 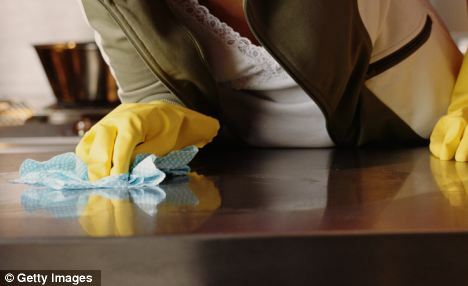 Bridget continued to wash the outside windows and stop for a few minutes to talk with the hired girl next door, around 10:30 she had gone inside to begin cleaning the inside windows. It’s said during this time Lizzie sat in the kitchen reading an old Harper’s magazine and eating a pear while she waited for the iron to heat up to press some handkerchiefs. Fifteen minutes later Andrew returned home, and was told by his daughter Lizzie, “Mrs. Borden has gone out – she had a note from someone who was sick. The Borden daughters would only address Abby as ‘Mrs. Borden’. He then went to lay down and take a nap in the sitting room, he was completely unaware that his wife was laying dead in the guestroom in a pool of her blood; he also didn’t know he was never to wake from his nap. Bridget had gone up to her room in the attic to take a nap while Lizzie went to the barn looking for a lead sinker because she planned on going fishing the following Monday, she claimed she had been in the barn for twenty minutes while she ate some more pears she had picked off the pear tree. Afterwards she entered the house and went to the dining room to lay her hat down. Crime scene photo of Andrew Jackson Borden, Lizzie claimed to have walked into the “sitting room” where she found her father’s murdered body. She asked Lizzie “I was out in the yard, and I heard a groan and came in. The screen door was wide open.” Lizzie responded, she then sent Bridget to get the Borden Daughter’s friend, Miss Alice Russell who lived a few blocks away. The neighbors were starting to gather on Lizzie’s lawn, someone had called the police. Lizzie said she didn’t know and that her stepmother had received a note asking her to respond to someone who was sick. Soon Dr. Bowen arrived and examined Andrew’s body, Dr. Bowen could not identify the body at first, seven large blows had gashed his face, his nose had been severed and one eye had been cut in half. Most of the blows had been within the area of the eyes, nose and ears. Blood still seeped from the wounds when he had a sheet cover Mr. Borden, but Abby was still unaccounted for. Lizzie had claimed she was sure Abby had come home and Bridget and Mrs. Churchill went upstairs to find Abby dead on the floor of the guestroom. Above and below are both crime scene photos of Abby Borden at different angles. Lizzie claimed to have not known about her mothers murder until Bridget and Mrs. Churchill went up and discovered her. Mrs. Churchill would later say that she only “Looked like the form of a person.”, she like her husband had been beaten to death by an axe. 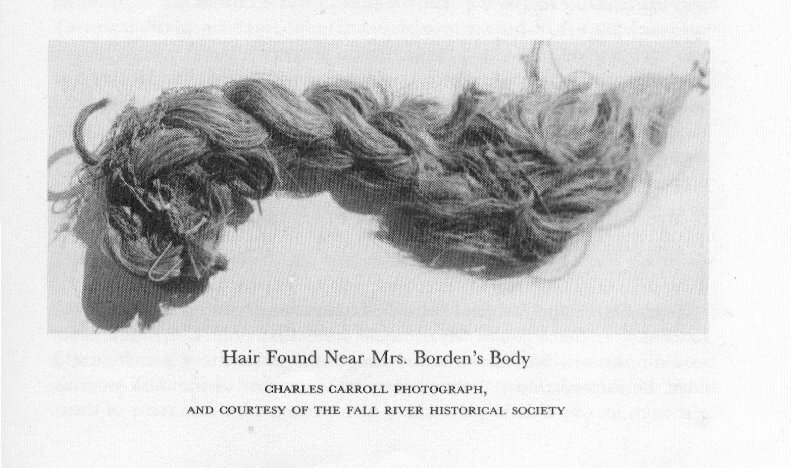 Dr. Bowen noticed that Abby had been struck over a dozen times from the back of her head, in her autopsy it was revealed that there was nineteen blows to the head. Pictured above: Crime scene (close-up) of Andrew Borden’s butchered body. 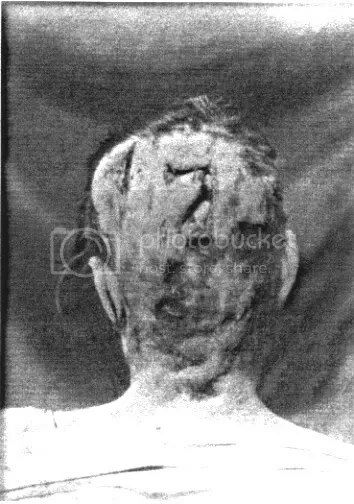 Crime scene photo showing the back of Abby Borden’s butchered head. The next hour or so at the Borden home was chaotic, people were all over the house sneaking looks at the gruesome state of the bodies and comforting Lizzie. 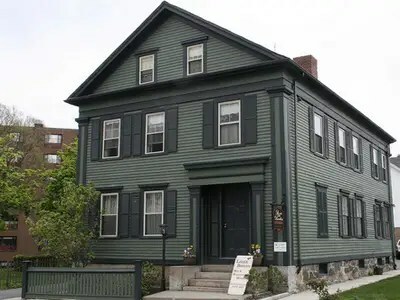 All the people had destroyed any clues that could have been left behind; The reason being the annual picnic of the Fall River Department was hosted that day and only one officer had gone to the Borden house, George W. Allen, and after only being there a few moments he had ran the 400 yards back to the department to tell the city marshal the gruesome details. On August 12th 1892 Lizzie was arrested for the murders of her father Andrew and stepmother Abby. 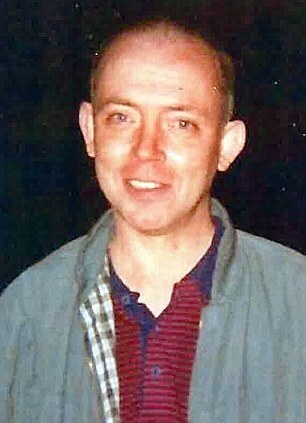 The trial lasted from June 5th of ‘93 to June 19th. 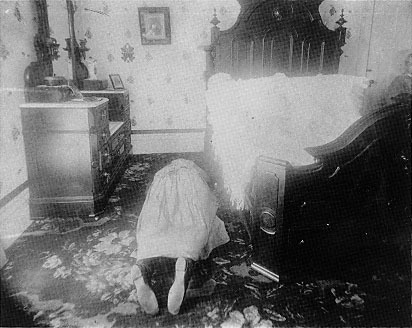 Although people had testified that only days earlier Lizzie tried to buy poison from a Smith‘s drug store, Miss Alice Russell said she had seen Lizzie burn a dress in the kitchen stove, and the fact that Lizzie’s story was barely believable because the barn she claimed to be in was dusty and untouched, the ‘letter’ Abby had supposedly received was never found and that her motive was clear because her father was going to rewrite his will leaving almost everything to Abby instead of his daughters, she was found not guilty on all counts by a jury of twelve middle-aged farmers and salesmen. Five weeks after the trial had ended Lizzie (Who at this point went by ‘Lizbeth’ instead) and her sister Emma bought a thirteen bedroom Victorian house at 306 French St. on ‘The Hill’ which was the most fashionable area of the city. Lizzie had the name of her new home carved into the top step leading to the front door, this house was dubbed ‘Maplecroft’. In 1904 Lizzie befriended a young actress, Nance O’Neil who was rumored to be having an affair with Lizzie, She would often throw parties for her new friend at Maplecroft. In 1905 Emma and Lizzie got into a fight of an unknown subject and Emma moved away, the two never spoke again. On June 1st 1927 Lizzie died after a long illness from complications of gall bladder surgery. Strangely enough Emma died only a few days later on June 10th after falling down the stairs at her home. They were buried in plots next to Andrew and Abby. Many theories still float around as to what went down that day, but who ever had killed Andrew and Abby has brought their secret to the grave with them, all that is left is spirits who will never rest until this mystery is solved. You looking for a place to rest your head and go home with creepy stories? Thrill seekers, Ghost hunters and people who want to be spooked alike can now stay in the Borden house that is now a bed and breakfast designed to make you feel like your back in 1892. Almost everyone that stays there has a story to tell of the paranormal activity they experienced. Doors will often open and close when no one is around to have done it, heavy footsteps on the stairs can be heard, figures will be seen roaming the halls and rooms, beds becoming messy within seconds of looking away. On rare occasions people have even reported to seeing a women making the bed in the guestroom, even when they are still laying in it. Muffled conversations are common coming from vacant rooms. One of the most creepy reports is people seeing the form of a person sleeping in a bed when no one is there. 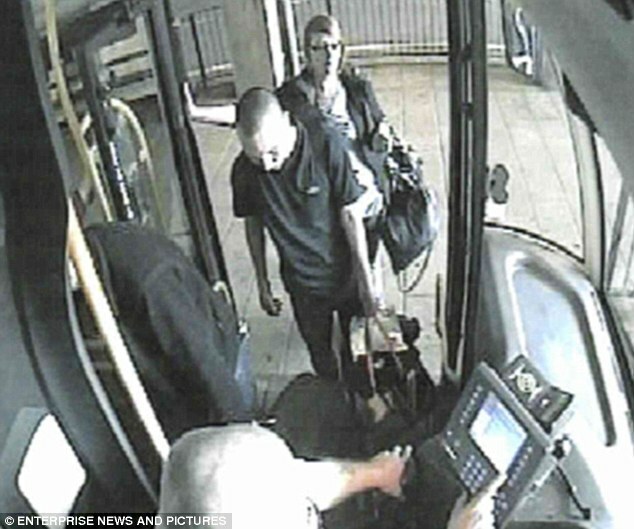 Items have also been known to go missing only to appear much later in either the same area or different. Ready to go home with chills in your spine? Enter at your own risk.